This story is so authentically Third Doctor that I didn’t notice until a re-listen that the characters are all in HD, so to speak, with a little more depth, motivations, and complexity than was typical of the UNIT era that I first fell in love with as a child. Newly freed from Earth exile, the Doctor revels in being able to rub shoulders with aliens again instead of only boasting about ones he’s met before. But this time, Jo winds up in charge for a change, ordering him and Mike around as her assistants. They’re soon caught up in a political drama that could mean war or peace for a significant chunk of the galaxy. 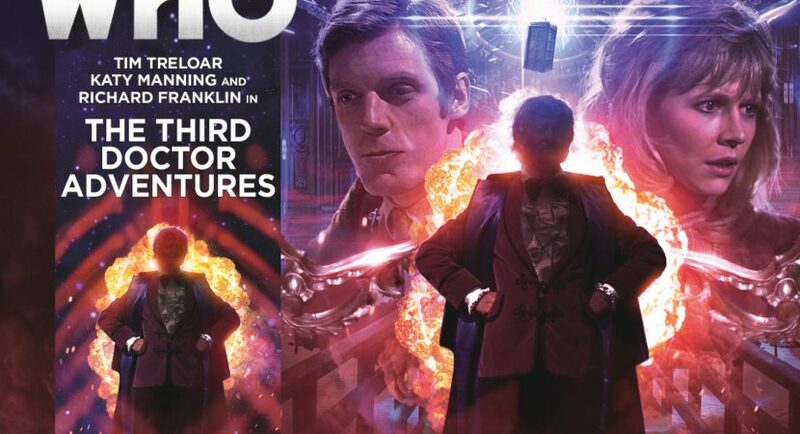 Alien ambassadors, phony commissioners consultants, sabotage and murder, bigotry and culture clashes: the echoes from Curse of Peladon and Frontier in Space are obvious. Yet this story has enough original elements to feel familiar without seeming stale. First of all, there’s an interesting juxtaposition between the classic Proud Warrior Race aliens and human megacorporations, the two dominant powers in this region of space. Director Tina Andresson, a ruthless businesswoman, will do whatever it takes to seal a lucrative deal for stockholders, including marry a giant horned alien. Regent Tharlar, meanwhile, needs allies, even if it means pinching his nose to marry an accountant. The frictions between their loyal seconds-in-command threaten to blow up the wedding before it starts. Nor are cultural differences the only threats to their alliance. Posing as a security consultant, Jo needs to head off any plots before she, Mike and the Doctor fall under suspicion themselves. Doctor: Be careful, Jo. This chap obviously want to isolate you so he can fill your ears with his own concerns and issues. Don’t let him sway you just because he’s human. Jo: Don’t worry, Doctor. I’m more concerned with you being swayed by the Chalnoth. I know what you’re like with alien races. Second, it’s fun having Jo calling the shots, thinking on her feet, and proving she may be a ditz but she does have some good instincts as well as compassion and guts. (Anyone writing Jo should be required to hear Katy talking about this script in the extras; she has some great insights into the character). The Doctor has his moments of derring-do and panache, but for the most part he’s simply the liaison with alien dignitaries, taking the pressure off Tim Treloar (who’s doing a fine job as Pertwee, so long as he relaxes and doesn’t spit words too explosively). Mike is a bit backgrounded, but nevertheless there’s opportunities for him to flash his competence, easygoing charm and humour. Third, there’s a few standout moments with Jo talking to the station’s computer, “A.I.” I won’t spoil it, but there’s a really great scene between them. Helen Goldwyn, longtime Big Finish mainstay, outdid herself as both A.I. and as eccentric wedding coordinator May Zalrick. And finally, there’s a decidedly modern non-romance in this story. The betrothed couple are as far removed from True Love as one could possibly imagine, each entering into matrimony with no illusions that it’s anything but a diplomatic/business relationship. The scenes between them towards the end felt genuine in a very real-world way. Bonus: remember the Doctor greeting Liz Shaw by waggling his eyebrows in a Delphon greeting all the way back in Spearhead From Space? The Delphons finally put in an appearance in this story: not for long enough, in my opinion, but then I’ve been waiting for nearly 40 years to “meet” them! Havoc of Empires is a solid addition to classic Who season 10. I found it a little slow going on my first listen, but I’ve enjoyed relistening several times. It pulls off what drew me to Big Finish in the first place: creating new episodes of an era of Doctor Who I loved, close enough to the style of that era that it really does feel like a restored missing serial. *sounding uncannily like Mary Tamm. Oh, drat, another minor nitpick, or at least an observation. I do get tired of the “Doctor and companion arrested/framed as the culprit” plot, so I’m glad that was only a minor part of the story. On the other hand, after so much buildup about how Jo, Mike and the Doctor needed to maintain their cover story, I’m surprised their big reveal was handwaved offscreen, and that Lady Gurlen and Louis Markell were willing to accept their word that the impostors were guiltless, while the real culprits were an ambassador they’d seen killed and the real security coordinator whom they hadn’t seen at all. For that matter, it’s a little awkward that Gurlen and Markell repeatedly asked after the fourth member of Jo’s team during Part One and Two but stopped asking about him after the bombs started going off and the Doctor was implicated. Then again, security on this station was— as the Doctor observed at the start— a little slipshod.